Ezi Solution POS is a powerful and scalable Point of Sale system for larger stores and for stores with high volumes of transactions. Mirrored disks and an uninterruptable power supply are recommended. For maximum performance and reliability each POS station has a local database, with the ability to synchronise with the database on the server. Larger tables are partitioned to increase capacity and performance. Ezi Solution POS includes features for Inventory Control, Accounting and an interface for web stores. Connect POS hardware such as a Docket Printer, Barcode Scanner, Cash Drawer, Pole Display, Scales and Touch Screen to create a powerful and resilient POS system with one or more POS stations. Buy a permanent licence key or rent for 12 months. Multi-Location features are in the standard download but not active. These allow stock to be transferred and viewed between stores. A temporary or permanent licence is required to unlock the multi-location features. See Support Info for more details. 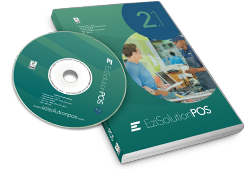 Get Ezi Solution POS Version 2.1.52 here! A full functional demo for 90 days worth of transactions. A temporary licence key is required for each POS station. The latest support information is in the Help File. Licence keys for Retail man will not work with Ezi Solution POS! Download manuals :- Installation and Upgrade Manual and Setup Manual for more information about Ezi Solution POS. Buy Ezi Solution POS using PayPal, credit card or by bank transfer. Gold Support is recommended for enhanced support to minimise system down time. Consider the cost on sales if your POS system is not working. Free Support is provided by E-Mail, with a target response time of 48 hours. Details of the PC and POS hardware supported by Ezi Solution POS. Hardware from many vendors will work with Ezi Solution POS. Upgrade to Ezi Solution POS from Retail Man POS. Increase the number of licensed users / POS stations. Latest support information & advice on Ezi Solution POS. How to upgrade the software. Multi-user operation. Multi-location operation. Support options. Language Files. How to remove the software. Frequently asked questions. Visit Ezi Forum for discussions on the use of Ezi Solution POS software and hardware. • One Ezi Solution POS licence key is required for each POS station or workstation. • A 2 user licence supports two POS stations or workstations for one retail outlet. • One free user is given for each 10 users purchased. • Rental for 12 months is available, with free upgrades.